National Taiwan University, Taipei, Taiwan. June 25-27, 2012. 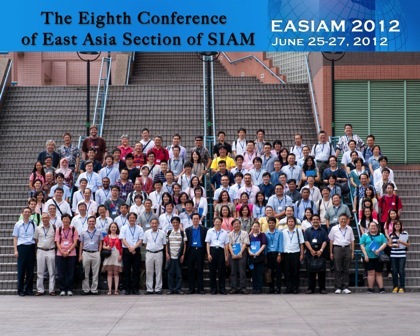 The 8th East Asia Section of SIAM Conference (EASIAM 2012) will be held in National Taiwan University, Taipei, Taiwan, June 25-27, 2012. EASIAM 2012 gathers researchers in applied mathematics with respect to science, engineering and technology. The scope of the conference covers all aspects of applied mathematics, from science, industry, to engineering and technology in the East and Southeast Asia. Previous EASIAM conferences were held in Hong Kong (1st), Sapporo (2nd), Xiamen (3rd), Daejeon (4th), Brunei (5th), Kuala Lumpur (6th), and Kitakyushu (7th). EASIAM is a section of Society for Industrial and Applied Mathematics (SIAM). It promotes basic research and education in mathematics, which supports science and technology.